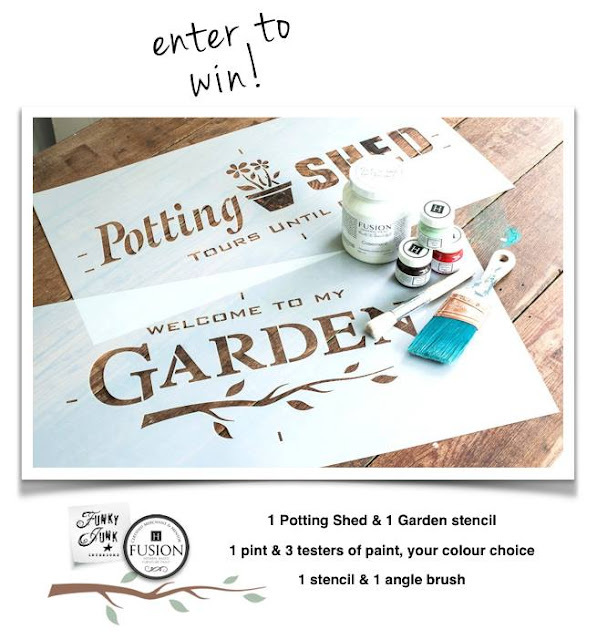 Beyond The Picket Fence: Welcome to my Garden...Stencil & Paint GIVEAWAY! When my friend Donna at Funky Junk Interiors asked if I was interested in trying and sharing her new Garden and Potting Shed Stencils, I said, YES please! And when she said she was happy to give away a set of her stencils to one of YOU, along with Fusion Mineral Paint--I said, WIN-WIN! But, thankfully a few days ago the husband did find one on Craigslist for me for $5 (I guess he's a keeper)! I chose to paint the wheelbarrow a color that would "coordinate" with the surroundings, but not blend in too much. I wanted a lighter color so the flowers would not get too hot and dry out too quickly. Little Speckled Frog from the new Fusion Mineral Paint Tones For Tots Color Collection was perfect. I wanted a little more texture tot he paint--not a smooth finish--so I used a bristle brush. I did paint the inside of the wheelbarrow too, just a quick coat. The thing I love most about Fusion Mineral Paint (well, besides the coverage, colors, and the built-in finish) is how smooth of a finish you can get with it. Other mineral and chalk paints tend to be so thick that you can only achieve a smooth finish with sanding. Use a nylon brush for a smoother finish. I painted the metal parts of the wheelbarrow in the Little Speckled Frog and then used Soap Stone for the handles or wood parts of the wheelbarrow and also for the stencil. Y'all, Old Sign Stencils are the highest quality stencils out there. They will last forever and they mix and match so well with other sets so you have lots of options! While Fusion Mineral Paint has a built in finish, I did give the wheelbarrow an extra coat of a clear, spray on finish intended for metal and outdoor use. Tip--when planting a large container, add empty aluminum cans in the bottom to take up space, provide drainage and make the planter not quite so heavy. This little robin seemed happy with my finished project and so was I. NOW, it is your chance to win free stencils AND paint! 1.) Leave a comment here on my blog telling me what you want to stencil. 2.) Visit Old Sign Stencils and come back HERE and and tell me which stencil is your favorite. 3.) Visit Fusion Mineral Paint and come back HERE and comment with your favorite color. This giveaway is open to residents of Canada and the USA, 18 years or older. Void where prohibited. Each blog will draw one name from their comments, which will be pooled together to pick one ultimate winner. This giveaway ends Sunday, June 5th, midnight Pacific, and winner will be emailed and announced on this post Tuesday, June 7th, 2017. Good luck and happy stenciling! **Giveaway has ended. Thank you! Please check out the other great bloggers participating in the Garden Stencil Launch. You can enter on each of their sites to win too! Enjoy and good luck! Seriously smitten over this idea, Becky! What a perfect little garden accent in a place you wouldn't expect! I love the colours too. 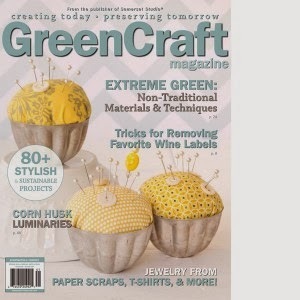 The speckled frog green is so fresh and vibrant! Adding that one to my list! Thank you ever so much for being a part of this garden stencil launch. I am so fortunate your talent is connected to this! Totally awesome! I love your wheelbarrow... now I have to find one for myself! Lovely, pinned, great stencils and great signs. I have these HUGE drift board that is just begging to become a cool sign. 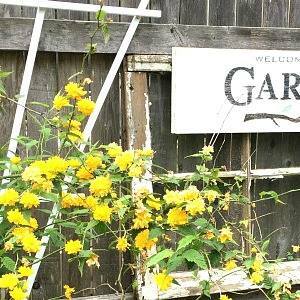 Love the "Welcome to my Garden" stencil! Champagne!!! What a stunning color!! I must have this! Love the soap stone color, what great choices. Love your wheelbarrow, it turned out so cute. I have an old wooden ammunition box that would make a great planter. That's what I'd paint and stencil. Love your wheelbarrow! 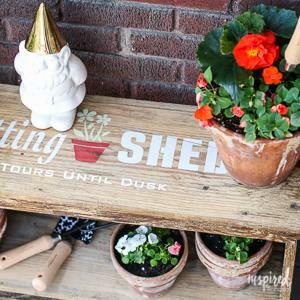 Would love to stencil a sign to attach to my potting bench!!! Love the Farmers Market sign!!! I have an old wood TV tray that I would love to paint and stencil...looking for more. Awesome wall decor. I love the Bingo stencil...and the Route 66. It's a toss up! Yours turned out so pretty, those stencils are very good lookin'. How can you pick just one color? I love the linen color because it reminds me of the paint my grandparents used on their screened in front porch. I see the slats of the old wood floor, the casings around the window screens, and the screened door that never seemed to stay shut for too long. I would spend hours on their porch, swinging on the porch swing...listening to the country sounds. Linen...funny how a color can bring back so many memories. I love the Route 66 stencil! 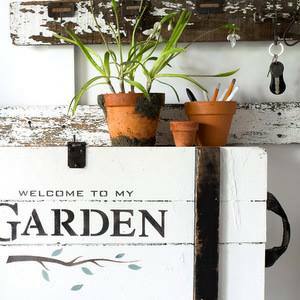 Love the Farmer's Market stencil to embellish a salvaged family keepsake and turn it into a sign! I'd have to flip a coin between Aubusson and Soapstone. Your wheelbarrow looks great! Love love this....I'd do a wagon ...thanks for the offer and your kindness of always sharing your ideas...your the bestest!!! Very cute wheelbarrow! So many wonderful colors out on the Fusion site--I love Ash the best. Love this idea! It's actually hard to pick which stencil because they are all so awesome! I love the GROCERY Stencil....would be such a cute addition to a farmhouse kitchen. I'm slowly getting there! I love all the colors...but I'm a grey person, so I'd have to choose the Little Lamb with soap stone stencil letters. Thank you for the chance to win such an awesome gift! I want to stencil some old boxes that I have. Thank you for the giveaway. I love the Potting Shed stencil. Thanks for the giveaway. I'd love to try the sterling paint color. Thank you for the giveaway. This is super cute and I love that you left the flat tire attached. So bright and welcoming. I would love to try the fusion mineral paint. I have an old table that I would paint the Champlaine white with coffee stencil. Love it! What a perfect place for a wheelbarrow that's so pretty now. Bet that poor thing didn't know it had such potential. And, yeah - kudos to your hubby for such a find! I love this project! Totally want to copy so a wheelbarrow is what I would stencil. And maybe the door to my new potting shed as well. Thanks for the chances to win! I like the Prairie Sunset colour the best. Thanks Becky! I love the hot cocoa stencil. Long Minnesota winters make for lots of hot cow & crafting! Love this wheelbarrow! I would like to stencil some garden boxes that we made last year. My favourite stencil is Welcome to my Garden. Fav colour Fusion Paint: Cathedral Taupe. I love the wheelbarrow idea!!! I have an old one and this is the inspiration I needed to use it for "yard art. My favorite color is Homestead Blue, but I love Lamp Light. It is the perfect shade of white. Thank you for the inspiration and giveaway. I would stencil some old barn boards that I have recently found. I just love old wood and signs. The Apple Farm and Cut Your Own Tree set is my favorite. I love Fall and Christmas and this set is perfect for both. Once again thank you for the inspiration and giveaway. Love your wheelbarrow. Homestead Blue for a color. Homestead blend coffee for the stencil. I have an old box I would like to do. I've had to re-write my comment three times since there are so many fun things to choose from! I'm in love with the Potting Shed stencil! Love your wheelbarrow project - you did a beautiful job! XO!! I love the "Welcome to my garden" stencil and it is a toss up between Cathedral Taupe and Ingelnook. Love the color selection. I want to stencil a piece of barn wood for my dining room. 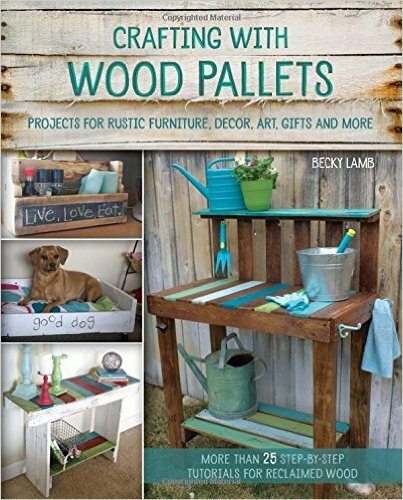 I love the Farmer's Market stencil and Inglenook color! I want to stencils some crates! Love the wheelbarrow! Okay, so I first thought I would just do a sign on old boards to put with my old ladders that I use for potted flowers and succulents. Then I realized I have an old wheelbarrow just rusting away! They say that copying is the greatest form of flattery - I'm doing it! Favorite stencil is .......all of them! I would like to try the Potting shed one, looks like you could do so much with it! Now for the Fusion paint, geez, how do you decide on a favorite? I sure do like that Upper Canada Green . . . . . . I have an older metal wheelbarrow that is not pretty, I'd have to copy your idea! The Potting Shed stencil for sure!!! This whole idea would be so cute in my new garden, I need pretty junk to add to the plants! I just built a small wooden cabinet with screen in the door. I'd love to stencil the inside so it would show through the screen. Or my little yellow flower box I built. Fun giveaway! Crossing my fingers & toes, lol! Apple farm, love it. Reminds me of my dad. He was always saying how bout them apples! Inglenook! Love greens!! Your wheelbarrow is adorable Becky. Great job. Wonderfully creative stenciling a wheelbarrow. The color was really fresh looking and you did a great job. 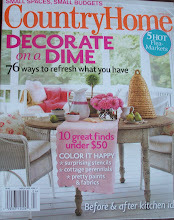 I would love to use the Farmhouse Market stencil and the paint color I love is Prairie Sunset. Love yellows and blues! I have a board that I found lying around a Middle School and I asked someone on faculty if I could possibly have it as I wanted to make a sign for my kitchen. They said Sure go ahead...and I was absolutely thrilled as it was the right size and was rustic looking. This is such a great idea to have a contest and I just don't have the knack to paint letters on a sign, but that stencil sure would do the trick. Thanks Becky for great ideas! I love the wheel barrow idea. would be perfect in my yard. I also have a bunch of barn wood that would make great signs! I like the coffee stencil and the BINGO stencil (if I had to pick) but they are all very cool. Just one color? They are all pretty. The Fort York Red is kind of sassy and the casement would go great on barn wood. I am making a potting bench out of mostly reclaimed products. I plan to dress it up with some paint and a stencil would look great. 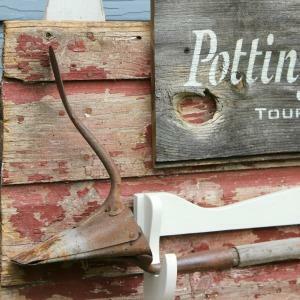 There are several of the potting shed stencil I would really love to have from Funky Junk interiors. I really love the Damask paint color from Fusion. Well after seeing your wheelbarrow I think I have to paint and stencil mine now! Love yours and the color is perfect! She has such great stencils .. have always loved the Farmers market one! 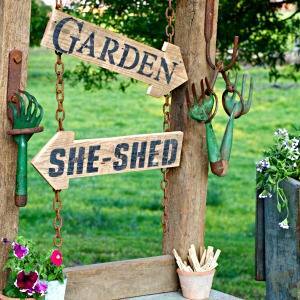 I would love to build a she shed and make a sign to put on it. My favorite stencil is the potting shed one. Fort York Red is my favorite color! Garden stencil is my new favorite! Very creative. Casement is a nice color. Have lots of old boards and tubs ready for painting. Love the wheel barrow. What a clever idea! All of Donnas stencils are my favorite. But I must say that I Love the winter ones the most. I would want to stencil some signs, chairs and wooden crates. Love to wheel barrel idea! Something new to try! My favorite color is Homestead Blue! Farmer's Market is my favorite stencil! Favorite color is Buttermilk Cream. Old wheel Barrel like the one you did! I want to paint my old wheelbarrow too! So many cute stencils but if I'm doing a wheelbarrow, I guess I would need the Welcome to my Garden stencil! Love Laurentien for the main color!!! So Pretty! Would really like to find an old wheelbarrow to stencil - love it! 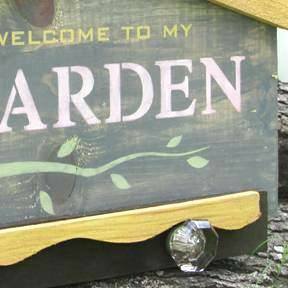 The "welcome to my garden" stencil is my fav! Love all the fusion colors, but my patio decor is becoming gray & yellow/greens so would have to choose Bedford & Aubusson, but like the warmth of Casement & depth of Ash too! Ash is my favorite and I have an idea for using it right away. Thanks. I want to stencil a sign with the antiques stencil. All the stencils are great. I like the Antiques and Collectibles one. Thanks.